Many	drugs	need	to	enter	the	cell interior	to	be	active. However,	to	their	large	size	or	high	net	charge,	many	drugs can	not	cross	biological	cell	membranes	by	themselves. 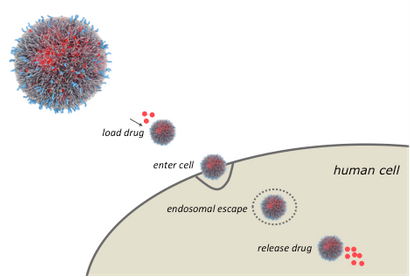 To	get	into	the	cell	nevertheless,	many	drugs	hence	have	to	rely	on	supramolecular	drug	delivery	systems. Such	nano-scale	drug	delivery	systems	need	to	be	smart	and	tunable	materials,	since	many	hurdles	have	to	be	overcome	to	get	a	drug	into	cell. Once	in	the	cell	interior	smart	drug	carriers	need	to	be	sensitive	to	a	stimulus	that	triggers	the	release	of	the	drug. It	is	for	example	imaginable	to	design	a	drug	vector	that	only	releases	its	cargo	once	it	feels	the	acidic	environment	of	a	tumor	cell. Such	smart	drug	vectors	can	be	self-assembled	from	peptides,	which	feature	an	excellent	biocompatibility	and,	in	particular,	are	straightforward	to	tune	and	optimize	by	changing	the	amino	acid	sequence. However,	to	precisely	steer	and	program	the	biophysical	and	pharmaceutical	profile	of	peptide-based	drug	vectors,	a	precise	knowledge	of	their	supramolecular	code	is	mandatory. Yet,	peptide	assemblies	are	often	not	amenable	to	most	high-resolution	methods	and	hence	poorly	understood	at	the	molecular	level. In collaboration with Enrico Mastrobattista (Utrecht University, Pharmacy Department), we have recently reported (Rad Malekshahi et al., JACS 2015) the local and global organization of the multi-megadalton SA2 peptide-based nanocarrier at unprecedented detail and at close-to physiological conditions. By integrating a multitude of experimental techniques (solid-state NMR, AFM, SLS, DLS, FT-IR, CD) with large- and multi-scale MD simulations, we could show that SA2 peptide nanocarriers are built of interdigitated antiparallel β-sheets, which bear little resemblance to phospholipid liposomes. Our high-resolution study provides a number of potential leads to improve and tune the biophysical properties of the nanocarrier and our approach may be of general utility to investigate peptide-based nanomaterials at high-resolution and at physiological conditions.